2018 Program information is shown below for your reference. If an accepted application is withdrawn for any reason up to two weeks prior to the start of the selected Hockey Camp week, you will receive a refund less a $50 per week administrative fee. If notification of withdrawal occurs within the two week prior to the start of the selected week, you will receive a refund less a $100 per week administrative fee. No refunds will be issued for any reason once the selected week has begun. 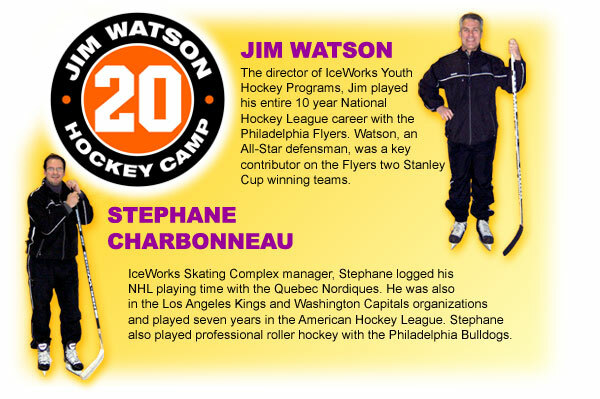 The Jim Watson Hockey Camp presented by IceWorks Skating Complex is designed to develop today’s young hockey player in a challenging, but fun, environment. On-ice sessions are separated by age group to assure skill-specific instruction. Individual player weaknesses will be pinpointed and addressed with a healthy dose of positive reinforcement. Every player who attends will receive a Jim Watson Hockey Camp jersey. Participants will be expected to be dressed and ready to skate at IceWorks at 8:30 a.m., with the day’s activities ending at 5 p.m. Lunch will be provided from a full menu at the IceWorks Restaurant. Instructors use the opportunity to stress the importance of developing healthy eating habits. The players will be supervised at all times and will not leave IceWorks property. The 2 1/2 hours a day of on-ice instruction is structured to optimize learning. Two high-tempo sessions for each age bracket per day will result in maximum improvement. Your week will be filled out with other great activities intended to foster camaraderie and good sportsmanship. The players will also be given a rest period between sessions in order to get maximum results on the ice.